Add photos and freely customize the collage as you wish. Freely save collage as JPG/PNG or directly share it via Facebook. 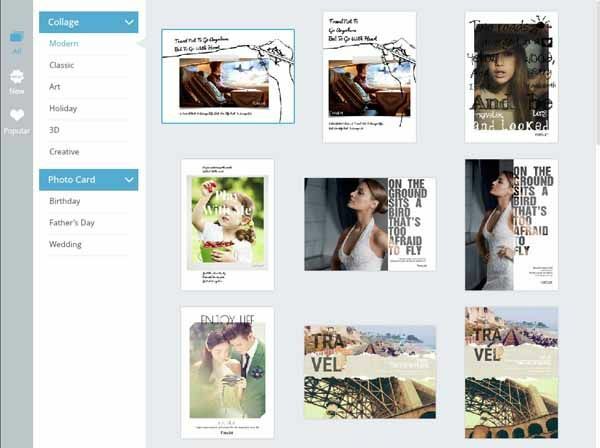 There are 190+ delicate templates for collages, posters and photo cards! First, choose one you like best to start your design in an instant. Next, add your own photos from computer or from your Facebook directly. You are free to adjust your photos whatever you want. There’s no limit to what FotoJet can deliver. Once your collage is done, you are given quick access to share it via Facebook or you can just save it as JPG/PNG in no time! Note: This is online application, so there is no need to download and install it.